Private 10309 Reginald Frederick James Oliver, 5th Battalion, Royal Berkshire Regt. change in the 1930s. The Olivers lived at No. 5. Reginald was born in 1895, the eldest child of James Oliver and his wife Harriet née Boyd. They had four more children: Montague William (born 1896), Gladys Edith (1898), Norman George (1901) and Leonard Frank (1902). 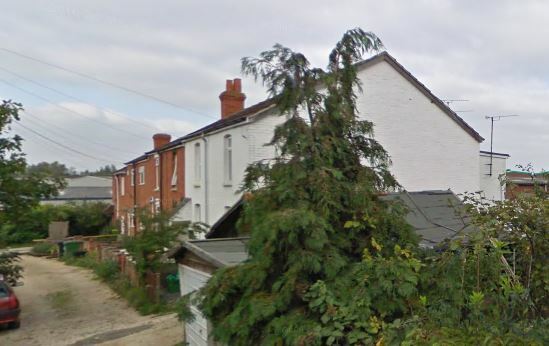 James described himself as a ‘mineral water maker’ in Newbury this probably meant that he was working for the Newbury Mineral Water Company, then operating in Mill Lane, very close to the Oliver’s home at 5 Junction Terrace. Reginald would have left school aged 12 or 13, and in 1911 was working as a baker’s errand boy. Sadly his obituary (below) in the local paper has a line or two missing, which seem to have included information on his employment immediately before he enlisted. By that time he would have been in adult employment, perhaps continuing with the baker as a trainee baker or shop assistant. 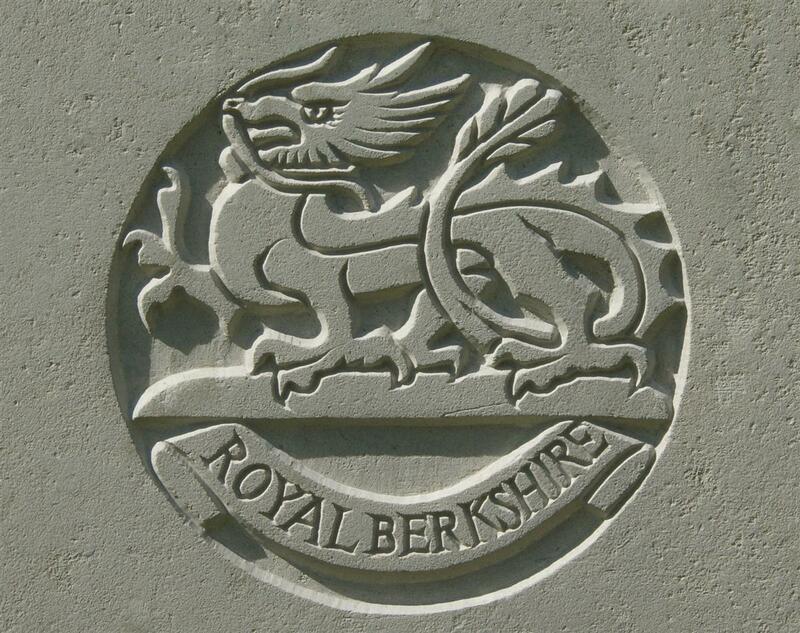 When war broke out on 4 August 1914 Reginald was among the initial rush to enlist; he joined the local infantry – the Royal Berkshire Regiment - on 10 August 1914. He was posted to a newly formed battalion – the 5th Battalion. This was the first of a number of new battalions created by the regiment in order to take in the thousands of volunteers coming forward as a result of the declaration or war and Lord Kitchener’s appeal for men. These new battalions would form whole new armies known as K1, K2 and K3 (K for Kitchener); together they are commonly referred to as the New or Kitchener Army or Armies. In the early months of the war the army had many problems coping with the hundreds of thousands of new recruits; the 5th Battalion, Royal Berks was allocated space at Shorncliffe barracks; space that rapidly filled to overflowing. Lack of everything was the order of the day – not only uniform and arms even plates and cutlery, washing up supplies – and, most critically, lack of experienced NCOs to train the new recruits. An account of the early days of the battalion can be found here. Eventually the battalion was deemed ready for deployment to the front and crossed to France as an integral part of the 35th Brigade in the 12th (Eastern) Division. Reginald and his comrades landed at Boulogne on 30 May 1915, one of the first New Army divisions to be deployed. Nothing specific is known of Reginald’s service at the front; the battalion diary and various regimental histories detail in general terms what they went through, but individuals of Reginald’s rank are rarely mentioned. The battalion took part and suffered many casualties in the Battle of Loos and again in the Battle of the Somme – which Reginald appears to have survived unscathed. Lance-Corporal M W Oliver, Royal Berkshire Regiment, who has been awarded the Military Medal, resides at 5, Junction Terrace, Hambridge Road, Newbury. He was the linesman, and on July 22nd gallantly went through the enemy’s barrage to mend and relay lines. He is now in a convalescent hospital at Boulogne. His brother Reginald has been at the front 18 months without leave; once he was in the train but was called back to the trenches. He was in the trenches 32 days for one period without a rest, and he has been through the big push. The story of Reginald being recalled to the line when he was sat on a leave train shows how little control soldiers had over their own lives – but he did get leave soon after, returning to Newbury for a few days just before Christmas. On 9 April 1917 the battalion was integrally involved in the opening of the Battle of Arras; this phase of the overall offensive also has its own name – The Battle of the Scarpe. 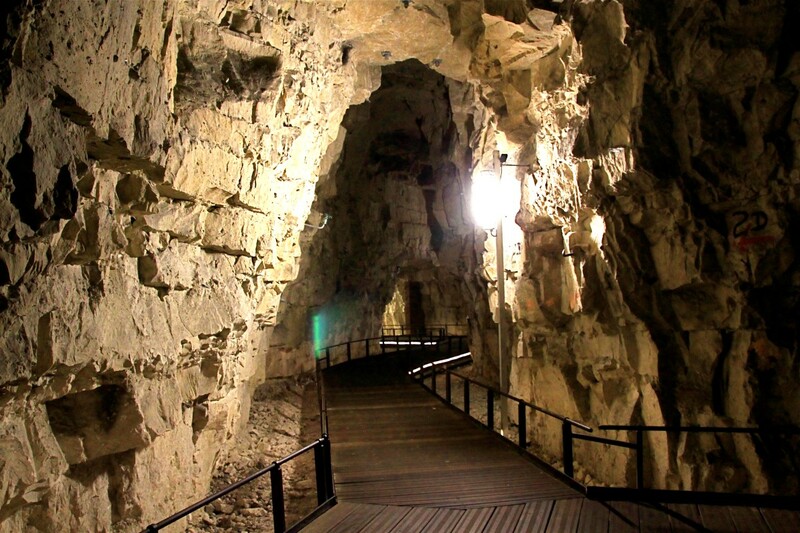 Through the previous day the 12th Division assembled in the cave and tunnel complex underneath the town of Arras. The plan was for two Brigades, the 36th and 37th to lead the way and take the initial objectives, designated as the black and blue lines; the 35th Brigade would then pass through them and take the third objective – the brown line. Part of the 6th Berks objective was an area known as Battery Valley; this lay behind the ridge on which the German lines lay and got its name from the large concentration of enemy artillery based there. far better lit than they would have been in 1917! The Division emerged from the tunnels at 7.00am and was soon attacking the German line; at 10.00am the 5th Berks and the rest of the brigade left their trench and advanced towards the fighting. BY 12.45pm they were in Battery Valley where they had to face the German gunners who were firing into them from 300yds over open sights. Picking off the gunners they moved forward and captured 22 guns some of which were promptly turned round and used against the enemy. However, success does not come at zero cost; although the casualties were light in comparison to other battles (7 killed, 96 wounded) men did die. Sadly one of those to die was Reginald, killed in action on 9 April. News has been received by Mr and Mrs J Oliver of 5, Junction-terrace, Hambridge-road, that their son has been killed in action. He was 22 years of age, and in his civilian days [typesetter’s error - missing text] on the outbreak of war he left his native shores to join the Expeditionary Force in May, 1915. He spent a period of home leave just before Christmas. News of his death was received from his captain, to whom deceased was orderly. He said that a shell fell between them. Both fell flat, and Oliver cried out, “I’m hit, sir!” His face assumed an expression of extraordinary peace and contentment, and he passed away, his death being as instantaneous as it could be. He was not only an exceedingly good soldier, but everybody in the company were devoted to him. Drummer T J Davis, of the Battalion, also wrote saying that before going into action he asked if anything should happen to him he was to let his mother and father know, and to say his last thoughts would be of them and that he died doing his duty. His remains were never identified (quite possibly blown to pieces or buried by a shell as it lay on the battlefield), so his name is remembered in Bay 7 at the Arras Memorial in Arras, France. Locally he is remembered on tablet 8 of the Newbury Town War Memorial and the Greenham parish memorial in St Mary’s Church. 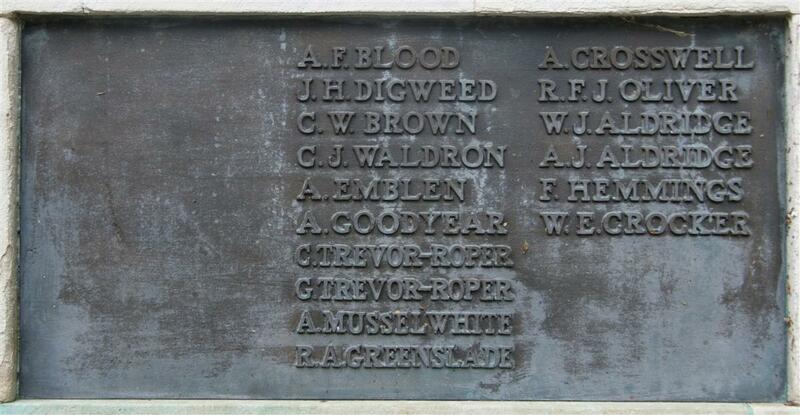 He was also remembered on a war memorial erected in Speenhamland School , which has not survived. Montague recovered from his wounds and served on until the end of the war; on 16 March 1919 he was discharged to the Class Z Reserve (leaving him liable to recall should hostilities break out again). Neither of Reginald and Montague’s two younger brothers, Norman and Leonard, were old enough to serve in the war; had the war continued Norman would have faced conscription in 1919. In 1921 Norman married Olive Keel; the following year Olive gave birth to their first child – who they named Reginald James Oliver, in memory of the uncle he would never know.